When I lived for a brief year in Chicago my apartment was placed directly across the street from a restaurant who earned the title of having the best Bloody Mary's in all of Chicago. And the beverages were fancy...the garnish especially. It was huge amounts of meat, peppers, pickles, onions, tomatoes, and so on situated on the rim of the glass. So, I was thinking about that place (missing their lobster roll brunch sandwich) and was thinking about edible fun garnishes for beverages. So I whipped up a fun quick pickle to garnish a Vodka Tonic, Gimlet (vodka and lime), Salty Dog (vodka and grapefruit), or...of coarse a Bloody Mary. Before I started the farm...when I was thinking about what I wanted to grow/produce, for a moment considered only growing apples and potatoes and distilling my own brand of craft vodka. So I flew out to Colorado to take a distilling class. I realized it wasn't for me but I did find one of their Vodkas very interesting. It was a spicy hot vodka that they highly recommended with grapefruit juice. It was fantastic...so definitely give pairing these pickles with a Salty Dog.... just a thought. 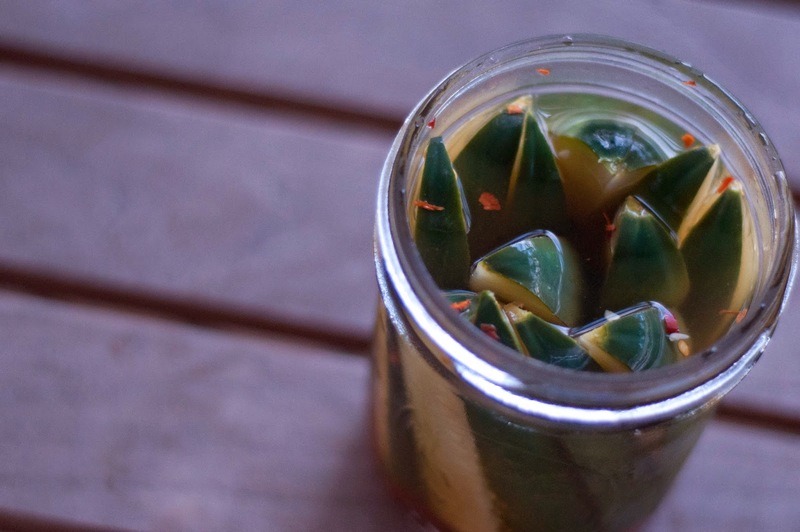 Pack jar with pickle spears. Add red pepper flakes and peppercorns to the jar. Combine vodka and tonic in a bowl and then add to jar. You will most likely have some extra vodka tonic...so throw it in a cup and enjoy. Allow to "pickle" for 2 days before using. These pickles a hot but smooth. Really fresh tasting and a great addition to party beverages. Oh Yum. I make my own bloody mary mix, so these pickles are the perfect complement. Keep sharing.